Microsoft has rolled out the first universal apps for Windows and Windows Phone, allowing users to buy an app once and play it on phones, tablets and PCs. The first two paid apps to take advantage are Microsoft's own Halo: Spartan Assault and 17-Bit's Skulls of the Shogun. Both games cost $4.99 and can be purchased through either the Windows Store or Windows Phone Store,. Microsoft has also turned several of its free games into universal apps, including Wordament, Hexic, Mahjong, Minesweeper and Solitaire. As WPCentral notes, this is more of a symbolic change, but at least users can be assured that their games (and achievements) will carry over across all Windows devices. Microsoft announced the long-awaited universal apps during its Build developers conference a couple of weeks ago. The long-awaited feature makes it easier for developers to port their apps between phones, tablets, and PCs, which will hopefully result in more apps for all platforms. Apple's iOS App Store and Android's Google Play Store have offered universal app purchases on mobile devices since the beginning, so Microsoft is effectively playing catch-up as it tries to build a broader Windows ecosystem (though it's the first to add full-blown PCs to the universal app mix). Still, Microsoft is keeping its Windows and Windows Phone stores separate for now, and developers must decide whether to turn their apps and games into universal purchases. Eventually, universal apps will come to the Xbox One, but Microsoft hasn't given a timeline, and the Xbox team will retain control over which apps will appear on the console. 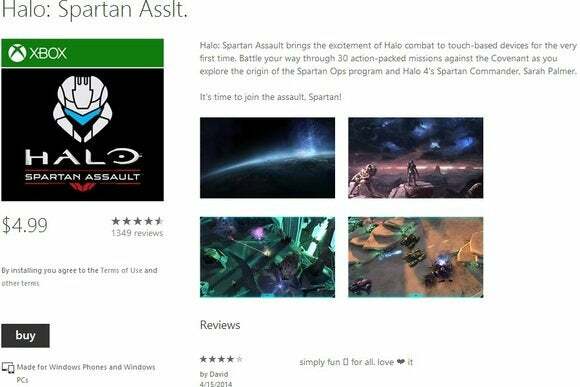 Halo: Spartan Assault is already available on the Xbox One, but must be purchased separately from the Windows version. To coincide with universal apps, Microsoft is also dropping the minimum price for paid Windows apps. Developers can now charge $0.99 or $1.29 for an app, down from the previous minimum of $1.49. Microsoft has said those two lower price tiers represent 55 percent of all Windows Phone app purchases. Cheaper apps should arrive soon enough, but a quick look through the top paid Windows Store apps hasn't turned up any dollar fare just yet.